Despite the utter devastation left in the wake of the massive tornado that tore through Moore, Okla., on Monday, the deadly storm, in many ways, helped show how far scientists have come in providing communities early tornado warning signs. In an era of budget cuts that threaten things such as new weather satellites and improved hurricane prediction, tornado forecasting is one bright spot where meteorologists have made steady improvements in accuracy and warnings, and where more gains may be made in just the next few years. A comparison between the Doppler radar-indicated debris path in orange and red, and the actual path of the tornado, in black, and areas of the worst damage, in yellow. Click image to enlarge. Credit: Travis Smith, NWS. Thanks to decades of investments in tornado research, upgraded Doppler radars and new, more localized computer models that can simulate individual thunderstorms hours before they form, tornado forecasts and warnings are now more accurate than ever. And they are set to undergo a sea change over the next two decades. Moore residents, for example, had about 35 minutes of lead-time before the twister ripped their town apart. (The warning was issued 5 minutes before the tornado touched down near Newcastle. That gave Moore, which is east of Newcastle, 35 minutes advanced warning, according to NOAA.). While 24 died and more than 350 people were injured Monday, that advance warning no doubt saved dozens, if not hundreds, of lives. Nationally, the average warning lead time is about 13 minutes. The history of tornado warnings shows a slow, but steady improvement of lead times and ability to quickly warn the public. In 1999 — the same year another EF-5 tornado struck Moore — the average advance tornado warning was approximately 10 minutes. “There’s a saying that’s been around for a long time: ‘seconds save lives.’ It’s still true,” said Bill Bunting, operations chief at the National Oceanic and Atmospheric Administration’s Storm Prediction Center (SPC) in Norman, Okla. The SPC is situated in the National Weather Center, about 10 miles from Moore, and meteorologists there were forced to take shelter from Monday’s tornado as well. The SPC is responsible for issuing tornado outlooks and watches for the U.S., while local National Weather Service offices issue tornado warnings for their particular area. Progress has been made for forecasts and warnings at three timescales: the long-range (out to about a week in advance), the short-range (when tornado outbreaks are mere hours away) and the very short range (when warnings need to be issued). All of these developments have helped lower the annual average death toll since reliable tornado records began in 1954. Long-range forecasts look four to eight days in advance of severe weather outbreaks. Meteorologists at the SPC first highlighted the potential for a significant tornado outbreak in Oklahoma on May 15, six days in advance. Making such a forecast would have been unheard of just a few years ago, Bunting said. From May 15 until the tornado struck on Monday, the National Weather Service, working with their media and emergency management partners, kept a steady drumbeat of messages flowing to the public. They repeatedly warned people to monitor the potentially dangerous weather conditions and to get to shelter if needed. Research has shown that early and consistent messages increase the likelihood that people will respond appropriately. Harold Brooks, a senior scientist with NOAA’s National Severe Storms Laboratory (NSSL) in Norman, said providing increasingly reliable long-range guidance is an important development that has helped improve the public response to short-term tornado warnings. Brooks said research underway at NSSL and at Columbia University’s International Research Institute for Climate and Society has begun to demonstrate skill at detecting signals of severe storm outbreaks as far as 10 days in advance. “We’re starting to pick up some hints that it can pick out a good fraction, at least, of severe weather events,” Brooks said of the long-range forecasting tool, known as the Climate Forecast System. In addition, Brooks said, forecasters think that sometime in the next 10 to 20 years that they could begin issuing seasonal outlooks highlighting the areas most at risk for tornadoes in any given spring and summer, much as hurricane forecasters currently do. It’s a development that would have been unthinkable just a decade ago. It’s not just long-range tornado forecasting that has improved. Weather forecasters have also become more adept at predicting when and where severe thunderstorms will form, and how high the likelihood is that a particular area will see significant, long-track tornadoes like the one that hit Moore, which remained on the ground for 40 minutes. On Monday morning, high-resolution computer models run by the National Weather Service and research institutions indicated that severe thunderstorms would likely form early in the day in central and southern Oklahoma, between 1 and 2 p.m., and that once they formed, they could rapidly turn into “supercells” — the fiercest of thunderstorms, which feature a persistently rotating column of upwardly moving air, part of the perfect recipe for tornadoes. In addition to giving birth to tornadoes, supercells are capable of producing large hail and damaging winds. These models were bolstered by observations from surface weather stations and upper-air weather data from balloons and satellites, all of which added to an ominous forecast. The tornado that struck Moore was spawned by a supercell that had formed only about 45 minutes earlier, southwest of Newcastle. Upgrades to the nationwide network of 122 Doppler Radars, which were completed in April, have given weather forecasters powerful new tools to help them predict the development of a tornado, and confirm that a tornado is, in fact, on the ground and doing damage. That can be an especially valuable tool when a tornado occurs at night, making it difficult for spotters to see it, or if it is wrapped in a curtain of rain, as the Moore tornado was at times. Conventional Doppler radars send out horizontal pulses of energy, but the dual-pol radars send out both horizontal and vertical pulses of energy, which gives forecasters a clearer 2-dimensional picture of the atmosphere. For tornado forecasting, the radars can spot airborne debris from large tornadoes, and identify the areas of large hail coming from supercell thunderstorms. The ability to detect airborne debris from a tornado is critical because it allows forecasters to issue tornado warnings even in the absence of reports from storm spotters on the ground. The dual-pol technology, which consists of new software and a hardware attachment to a radar dish, can clearly distinguish between hail and rain. This new technology has only been added to NWS radars during the past two years, constituting the first major upgrade to the radars since they were initially installed in 1988. In the case of the Moore tornado, the dual-pol radar clearly picked up on debris being lofted thousands of feet into the air, helping to confirm both the tornado’s strength and its location. 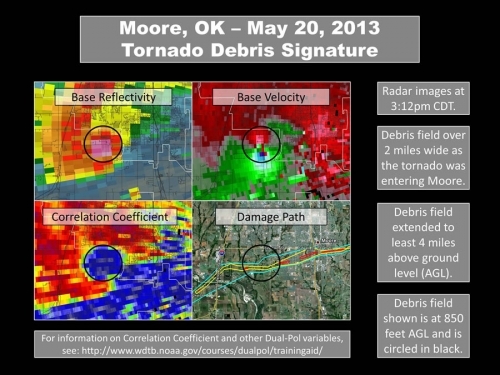 The debris signature, which was a jaw-dropping 2 miles wide as the tornado entered Moore, helped meteorologists determine the tornado’s path and speed. The NWS storm survey team, comprised of experts who can determine the tornado’s maximum winds by examining the wreckage, found evidence of EF-5 damage, putting the Moore tornado in the top tier of tornado intensity based on the Enhanced Fujita Scale. The NWS pegged the tornado’s likely maximum winds at about 210 mph — powerful enough to wipe out homes completely, leaving just concrete slabs on the ground. What the debris signature looked like using dual pol radar technology. Local TV meteorologists, relying on the NWS’ radar data, were able to give viewers a block-by-block tornado track forecast, emphasizing the radar and spotter-based evidence that the tornado was already causing significant damage. The combination of improved long-term outlooks, more reliable short-term severe thunderstorm forecasts, and upgraded radars means that weather forecasters are increasingly able to anticipate one of the most destructive weapons in Mother Nature’s arsenal. But the researchers in Norman, cognizant of the lives lost on Monday, realize the ongoing need to improve the communication of warnings, public response to warnings, and a wide range of forecast uncertainties. That would involve issuing warnings based on forecasts of rotating supercell thunderstorms. That kind of system would be a sea change from where forecasters are today. To achieve that goal would require considerable improvements in computing power, additional insights and advancements from the research community, not to mention more funding. It will also require the National Weather Service to maintain and upgrade its infrastructure, from surface weather stations to satellites, some of which are imperiled by budget cuts and program delays. While a warn-on-forecast system would be a breakthrough aiding prevention — and is years away — there are already advances being made to help those on the ground. An example of the large debris that was lifted into the air by the storm. This tank was filled and carried for one-half mile by the tornado, according to the NWS. First-responders in Moore benefitted from an experimental product that helped them determine where to focus in searching for survivors. That tool is under development at NSSL’s Hazardous Weather Testbed, a facility that researches and develops new forecasting tools. In short, the experimental mapping program utilizes the debris-tracking ability of dual-pol radars to help map the path of a tornado, and in turn, guide first-responders. 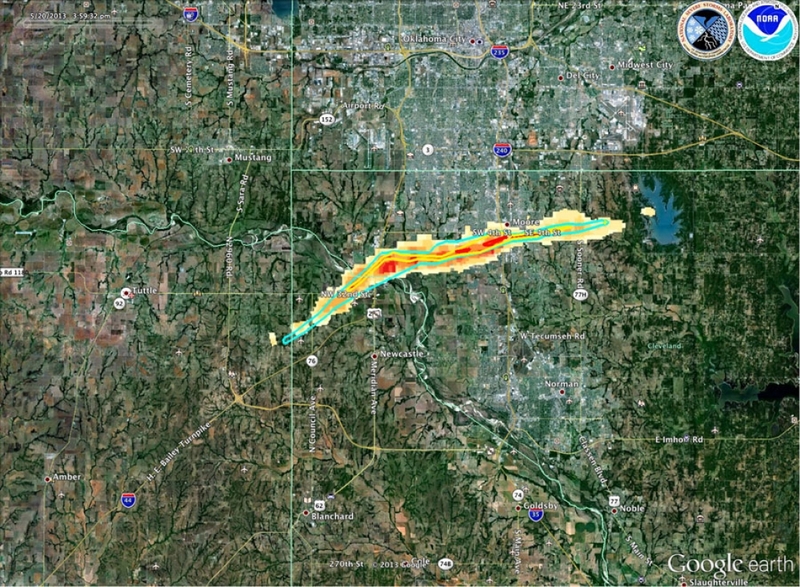 The radar-based estimate of a tornado’s path using the tornado debris signature is most useful within 30 miles of a radar site, said Travis Smith, a research meteorologist with NSSL and the University of Oklahoma. During the tornado, Smith was monitoring a version of the debris tracking tool in near real-time, and the Weather Service was providing the information to first-responders. “Once you get beyond that distance, the radar beam, which rises in elevation at longer ranges from radar, gets far enough away from the Earth's surface that the radar cannot sample the debris cloud unless it is very tall,” he said in an email interview. “In this event, the large amount of debris flying through the air, coupled with the close proximity to the WSR-88D radar site 10 miles east of Moore, allowed a very close match between the radar-estimated tornado path and the path discovered by National Weather Service ground survey teams,” Smith said. 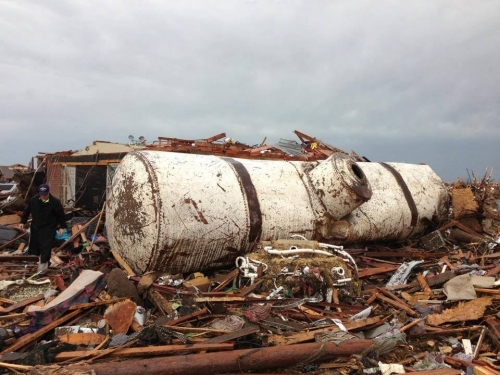 The radar detected a remarkably tall and broad area of debris — everything from vehicles to propane tanks and plywood — had been scooped up by the twister and launched as high as 20,000 feet in the air. The NWS is also working to lower the false-alarm rate for tornado warnings, with the dual-pol radars expected to help to some extent. Research shows that for every four warnings issued in the U.S., roughly only one tornado actually touches down. The false alarms can lead to a sense of complacency, reducing the likelihood that people will seek shelter when warnings are issued. To improve the public response to warnings, the NWS is also enlisting the help of social scientists who are advising the agency on how to better alert the public, through more carefully worded statements, for example, and by expanding the agency’s use of social media and mobile technology. Tornadoes remain as arbitrary as ever, sparing one house while demolishing another next door. But through a combination of scientific research and applied technology, the tornado gurus in Norman and elsewhere are making steady gains to ensure that forecasts and warnings are as accurate and timely as possible, bearing little resemblance to the finicky but powerful threat they describe.